Monday’s Brazen Careerist blog had a post with 6 Tips for doing a long-distance job hunt, which is helpful if you you plan to be part of the increased number of job hunters relocating for work. Relocating for work is a big step, even for someone who is young and relatively unattached: it can involve leaving behind a network of family-and-friends, and all the familiarity of a place you know well. For others, pulling up stakes could also mean selling a house, taking kids out of school, and possibly looking for two jobs in tandem. When does this decision make sense? If your job skills are still in demand, but the demand has moved elsewhere, relocating might make sense. For example, if your experience is in the pharmaceutical industry and you saw Pfizer leave Kalamazoo, and later Ann Arbor, Mich., relocating to pharmaceutical hubs like Philadelphia or Boston might make sense. On the other hand, if your job skills aren’t in high demand anywhere, like many manufacturing jobs these days, a better idea might be training and education that will prepare you for the jobs that are in demand in your area. A second career may also be more fulfilling, less disruptive, and frankly, less intimidating than moving. You may have the misfortune of a double-whammy, where your skills are not in demand and your city is suffering widespread economic decline, such as cities like Las Vegas, Nev., or Fresno, Calif. In which case, you may want to check out 10 Cities for Job Growth in 2009 and see if any of those places sound good to you. If big cities aren’t your cup of tea, according to the August 2009 Unemployment Report, Montana and Iowa seem to be faring pretty well. Who knew? As the Brazen Careerist article mentions, unless your skills are both rare and greatly in demand, applying for jobs in another city could be tough. No one wants to spend the money to fly you out for an interview if local talent is available, and companies that have relocation policies may not want to pay the extra up-front costs to move you. Pulling up stakes without a solid job offer, though, is an expensive and risky proposition. A story on NPR this morning, Jobless Benefits Exhausted, Still No Work (audio), does not paint a pretty picture: more and more people are still jobless after 39 weeks and their unemployment benefits are ending (26 weeks of unemployment benefits + 13 weeks extended unemployment benefits). 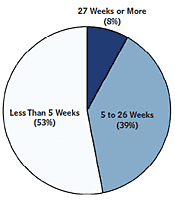 Fortunately, most people do find work long before their unemployment benefits run out: according to the Congressional Budget Office, only 8% of unemployment spells exceed 26 weeks (PDF). And many states have extended unemployment benefits beyond 39 weeks. How the Long-Term Unemployed Can Find Work, in yesterday’s US News and World Report, touches on the negative psychological effects of long-term unemployment. Work (as much as we may sometimes complain about it!) is a tremendously important part of our lives and our identities. The US News article offers some tips on how to combat those effects. Some of the tips for combating unemployment-related depression listed in that article are the very things that Foxsuit wants to help job hunters with. Look for new features on the site in the coming weeks to help you keep you your spirits up and your job hunt on track.